Life in the ancient world was risky business. The perils of war, disease, famine and childbirth are a just a few examples of circumstances that contributed to a much lower average lifespan in the ancient world than we have in the modern era. People in antiquity were no less concerned about the prevention and cure of maladies than they are now, however, and entire cults, sanctuaries and professions dedicated to health dotted the spiritual, physical and professional landscapes of the ancient world. So what exactly did ancient cultures do to combat disease and injury? In many societies, the gods played an integral role in human health. 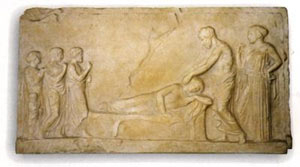 In the Greek world, the god Asklepios was dedicated exclusively to healing. Sanctuaries called Asklepions drew the ill and injured, who would often travel to seek the healing that they believed these ancient sanitariums could provide. Asklepions provided baths, healthy foods and sanctuary rooms intended specifically for sleep and meditation. Most Asklepions were located in remote and beautiful areas. Animal sacrifices and votive offerings were made at altars and temples to the god. Excavations at Asklepions have uncovered “anatomical votives,” so named because they represent the body part that was injured or affected by illness. By the fifth century B.C., physicians and the god of healing had become intrinsically linked, with Asklepios as the divine patron of the profession of physicians. Hippocrates, the most famous physician of antiquity, lived during this time, and medical treatises that he authored would be used as medical textbooks for centuries to come. From such writings, as well as other inscriptions, we see that ancient physicians knew that wound care, lancing, draining and cleaning infected wounds, promoted healing, and that they knew of certain herbs that had healing and disinfecting properties. They also knew of bone setting as long ago as the stone age. By the end of the first century B.C. Surgical techniques in the ancient world could be surprisingly advanced. The famous Roman physician Galen (c. 129–199 A.D.) is generally regarded as the most accomplished medical researcher of the Roman world, and some of his surgical procedures would not be seen again until modern times. He successfully conducted cataract surgeries by inserting a needle behind the lens of the eye in order to remove the cataract, and his described methods of preparing a clean operating theater reveal a keen awareness of contagion. By the seventh century A.D., medicine as a science that was relatively independent of religious restrictions had virtually disappeared in the west, as the use of cadavers for scientific dissection had been prohibited by the Church. However, Islamic scholars in the East were studying Greek medicine in depth. Herbs known for their anesthetic properties were promoted and physicians stressed the effects of diet and environment on health. Perhaps one of the most famous eastern physicians was Abu ‘Ali al-Husayn ibn ‘Abd Allah ibn Sina (980–1037 A.D.), whose work The Canon of Medicine codified existing medical knowledge. Later translations Latinized his name to Avicenna, and by the 13th century his work had become the standard medical reference text throughout Western Europe. Archaeology has further illuminated medical practices in the ancient world. Certain skeletons discovered during excavations demonstrate evidence of rather astonishing surgical successes. Perhaps the most startling evidence of sophisticated ancient surgery can be found in skulls that show signs of trepanation, a procedure still used today that is performed by drilling a hole into the skull to relieve intracranial pressure. Trepanned skulls from ancient societies in Central and South America, Africa, Asia, Europe and the Near and Middle East have been found that perhaps date back as 12,000 years ago. By examining the bone regrowth around the surgical hole in the skull, scientists are able to determine how long the patient survived after undergoing the procedure. Some patients died immediately, some lived only a few weeks, but others seem to have healed completely. Ironically, it is often the funerary monuments and graves of ancient doctors that attest to their care of the living. Tablets that decorated funerary altars of physicians often depicted the instruments of their profession. Scalpels, forceps, forked probes for examining wounds, needles for stitching wounds, small spoons for cleaning wounds and measuring medicines, catheters and even gynecological specula are all examples of instruments employed by the physicians of antiquity. Excavations have also revealed evidence of sophisticated dental practices in antiquity. In a mass grave a skull dating to about 200 B.C. was found that contains one of the earliest known dental fillings. A 2.5-millimeter bronze wire had been inserted into the tooth’s canal. Elsewhere, skulls recovered from the catacombs in Rome, which were in use during the first through the fifth centuries A.D., exhibit some rather pricey dental work: Several were recovered that have gold fillings.